Now that it’s well past Christmas, I can post this without sounding like a hater of the Ebenezer variety, holding fast to a grim scowl as other people laugh and play. I love Christmas, getting together and having a good time, I like getting presents, and giving them to others. And I, like most other kids in the western world, believed in Santa Claus when I was a kid. But when I think about it now, I don’t really understand why we adults go to all this effort to convince kids that he is. We all know Santa, I assume. 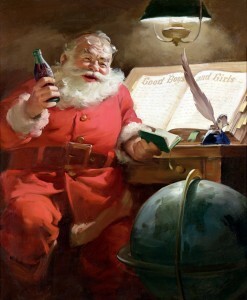 The jolly man in the red suit made so famous by Coca-Cola ads in the 20th century. He’s probably the best supported myth of our time, when you think about the evidence involved. You can send him letters and he’ll respond. You can meet him at the mall. You can wake up on Christmas morning and find evidence of his presence, in the form of half-eaten cookies and a number of gifts bearing his name. NORAD actually has a site and an app you can load up to track his flight pattern. There’s probably more evidence for the existence of Santa than there is for my own. You can send me letters and I’ll do my best, but I can’t be at every mall everywhere. And I don’t get it. Why do this? I don’t think we endorse a policy of manufacturing evidence and making false claims. Quite the opposite, actually. When it turns out that someone has lied to us, or twisted the evidence in such a way that we would believe a thing that isn’t true, we get upset. When the people doing such things are journalists, judges, politicians, or experts in a relevant field, we don’t just get upset, we get outraged, and rightly so. We rely on them to tell us accurate things about the world. If we find out that a couple of politicians have gone all Wag the Dog on us, we’re furious. Why then is it okay to manufacture evidence for something that isn’t true, and pass that on to children? It seems like most of the obligations we have to each other are enhanced when it comes to children, because children rely on adults to accurately interpret the world for them. Adults are in possession of facts that can help them get by, and in virtue of having those facts ought not to deceive about them. “Hot stoves can burn you”, is a fact that an adult might give a child. Saying the opposite would essentially be encouraging a child to touch hot stoves, and thus get burnt. I don’t think I’m going out on too much of a limb in asserting that we’re not okay with that. The Santa claim seems to be the same way, though. We know it isn’t true, and know that the evidence is manufactured, but claim it anyway. 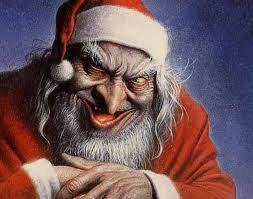 All of this is intensified by the role that Santa Claus plays in managing children’s behaviour. Santa only comes for well-behaved children, and withholds presents (at the very least) from poorly behaved ones. In this, the Santa myth serves as a parental scapegoat. It’s not that the parents will hold back gifts or directly administer consequences for poor behaviour, but the consequences will instead be administered by a supernatural force, with parents only minimally involved. It’s essentially a threat of supernatural punishment, and a completely fabricated one at that. It’s possible to come from a family where the concept of Satan working evil on earth is part of a household belief structure, where it’s thought that dark forces will actually act to punish people. It seems impossible to grow up in a household where both adults and children genuinely believe that Santa Claus will withhold gifts as a punishment. In this, those who believe in the agency of Satan have one advantage, they at least believe what they’re passing on to their kids. For a Santa household, it’s a deliberate deception which, in a sense, robs parents of some of their authority to administer consequences. The whole Santa myth bothers me in part because it perpetuates this idea that lying to kids somehow isn’t really lying, which doesn’t seem like it properly takes into account the stake that kids have in our telling them the truth. Kids have enough reasons not to trust adults, we shouldn’t be in the business of giving them more. Next week I’m going to address what seem to be the three main arguments for convincing kids to believe in Santa, and why they don’t hold up. Would you help your kids believe in Santa? If so, why? If not, why not? We kind of walked a middle line with our kids, and I’m pretty happy with how that turned out. We didn’t push or encourage the idea of Santa, but we didn’t actively discourage it, either. We never held it over their heads (partially because if they only behave because of Santa, what happens to their behavior when they realize he’s not real?). Gifts under the tree were from family. If they wanted to put out a snack for Santa, it was Guinness and cookies – also Mommy and Daddy’s favorite Christmas snack. For awhile they believed, based on the strength of culture. When they asked if Santa was real, we asked them what they thought. Soon it became obvious that they believed in Santa because it was more fun that way. Eventually that faded, with no pain or trauma – I believe it was an easier transition because not only hadn’t we lied to them, but the loss of Santa didn’t change any of our traditions. At one point, they asked if I believed in Santa. I said I’d never seen him and I knew that I was the one who bought the presents under the tree. And I was glad about that, because I think it’s fun to buy them presents. Now they also enjoy buying and making gifts for people – that’s part of the fun. I never wanted to put in the work that goes into supporting the Santa myth. I’ve seen parents really stressed out about it, trying to sneak around, come up with elaborate explanations, etc. It just never seemed worth it to me. I don’t regret the small role Santa played in my kids’ lives. I’m not a parent, so I tried to focus on Santa as an ethical concern between humans, but if I may say so, I think you handled it very well. I think you’re right, maintaining the truth of it seems like a lot of work around what can be an already stressful time of year, and it doesn’t seem essential. We can get what we want out of Christmas, even Santa, by just thinking of it as a tradition rather than a real thing. We dress up on Halloween because it’s fun, not because we think it wards off evil spirits. It’s interesting that they believed on the strength of culture, though I don’t think it’s surprising. Kids believe in all kinds of things, that’s part of being kids, but motivating them to think critically about those beliefs rather than endorsing them seems to be the mark of a responsible adult, and seems to be a much better way of dealing with the belief than a simple yes or no answer. If I may ask, as a parent, why do you think that other parents get stressed about it?